Over on Hack & Slash, -C wrote a blog post called On How an Illusion Can Rob Your Game of Fun that reads like a manifesto. It belongs to a whole cross blog conversation that I haven’t really read up on. Maybe I will. In the comments, some people argue that the quantum ogre isn’t so bad. I disagree. Here’s why. The quantum ogre is only bad if the players have information that ought to help them evade it and they cannot. But in addition to that, having to make a choice without any information is also bad. Thus, we’re talking about two bad things. An adventure involving the quantum ogre is bad because the players’ choices don’t matter: either they don’t have enough info to make a meaningful choice or the information they have is useless since the quantum ogre will show up no matter what they do. They have no agency – they have no capacity “to make choices and to impose those choices on the world.” Either they cannot make a meaningful choice because they lack information, or they cannot impose their choice on the world because the quantum ogre shows up anyway. Update: A comment by Trey on the «On How an Illusion Can Rob Your Game of Fun» blog post wanted to know about the differences between a single quantum ogre encounter and the use of random encounters. Both of them remove player agency and yet the sandbox proponents don’t decry random encounters. Why not? I think there is a way to improve random encounters because the quantum ogre and random encounters exist in a continuum. The quantum ogre is at the one end. No matter which way you turn, the ogre encounter happens. Next to it, we find random encounter tables. No matter which way you turn, eventually you will meet an item from my precious list. Next to that, we find differing random encounter tables depending on the surrounding areas. No matter which way you turn, eventually you will meet an item from one of the appropriate regional lists. Finally, the last alternative I can think of is having no random encounters and only lairs placed on the map. No matter which way you turn, you will meet the appropriate item for this hex on my precious map. I’m sure there are more variations. For my own games, I try do #3 and #4. Players get to pick the important encounters by choosing to explore the mountains where they need to fight a frost giant (#4). In addition to that, there are rumors about a white dragons (also #4 with partial information). What players don’t know is that the icy glacier environment also supports winter wolves (#3). In addition, the trolls are on a war path and thus I have added them to the random encounter list (this starts out as #2 but eventually moves to #3 as players learn about current events in the sandbox). This creates meaningful choices: If players don’t feel like fighting frost giants and white dragons, they can avoid the area. Thus, I agree with Trey’s comment. Simply having a random encounter list is only marginally better than having a quantum ogre. Basically you’re just having more of them. The key is introducing ways for players to make meaningful choices and have those choices make a difference. I do not think that random encounters reduce the player agency. Hence they are not to be compared to the Quantum Ogre. The trouble with the Quantum Ogre is not that the GM decided to make it a Quantum Ogre and not a Quantum Leprechaun. It’s that no matter what the players do before meeting the Ogre, they will still bump into that particular situation. Because the GM decided beforehand that there will be a Quantum X she has to force the fiction toward the Quantum Moment in one way or another. That is where the reduction of player agency comes from. Put differently: Its not that the “Ogre” in “Quantum Ogre” was decided by the GM that is the problem, its the “Quantum” part. If the “Ogre” was the problem, then only the players would be allowed to decide on what is waiting behind the next bend, since both a GM and the dice would be an infringement on their agency. Archipelago all over again! When you put together a random encounter list for an area, all you say is that some things that you think might be interesting are likely to happen. You as the GM are allowed to make decisions as well (not just the players) and somebody has to do it at some point. By design, you have no means to steer toward one encounter or the other and hence you have no reason to infringe on player agency. The important part is to make the encounters in such a way that they add interesting options for the player and not each be a Mini Quantum Moment. So “3d4 Orcs attack the party in a night raid” is infringing, “You encounter 4d6+4 Orcs playing rugby with a severed troll head” is not. Also note that agency is not nonnegotiable. As a player I am absolutely in favor of being forced into situations by the GM, as long as they are interesting and fit the character of the fiction at that particular moment. Last Monday you had the Judge point the finger at my Midwife. I got arrested because of that, a clear infringement of my agency. But I liked that because it made the story more interesting and while my options were reduced it was instantly clear that deciding and carrying out my remaining options got so much more important. So if agency = sum (importance of each option) then you reduced the number of options but raised the importance of the remaining ones. A fair deal! Honestly, I don’t think region-based random encounters are that much better than the single list. I see that you can influence what types of encounters you might face, and thus avoid certain ones, but it seems like you still get stuck fighting random bags of hit points. I think the big thing that would differentiate random encounters from the quantum ogre is that the players have ways of affecting random encounter frequency. Are there things that they can choose to do that can decrease (or increase) the likelihood of a random encounter, or better yet, certain types of random encounters? I think I agree. If the creatures encountered will always fight, then there is not much choice involved except whether to run or not to run. Being able to avoid encounters, being able to talk your way through encounters, being able to learn from them – these are ways to empower players. More choices. As to reducing the encounter frequency, I think we need to make sure that the “ways of affecting random encounter frequency” players have involve meaningful choice. I’d propose asking “what’s the trade-off?” If there is no trade-off, then reducing the frequency is always the better choice. Two examples off the top of my head: In a D&D 3 or D&D 4 game, you could say “I made the choice of investing in Survival skills and therefore I should be able to reduce the encounter frequency”. In a classic D&D game you could argue that traveling at half speed is an appropriate trade-off. Either option would work for me, but I have the nagging suspicion that these choices are not too interesting. I’d rather have more encounters, more talking, more fighting, more running, more learning. Now that I think about it, I’ve been doing it wrong all this time: I’d roll for day and night encounters all the time irrespective of whether the party was traveling by night or day since travel from hex to hex takes a day and most hexes are wilderness. Thus, there is never a “safe” place to sleep and therefore I thought that I should roll for both day and night encounters. This adds a little bit of simulation, but it also makes player choice irrelevant! I think from now on I will only roll for wilderness encounters if the party actually travels. Thus traveling by day results in different encounters than traveling by night. Staying put results in no encounters. Start a campfire, have a decent warm meal, and you are fully rested the next day, but you potentially attract attention. Roll for a night encounter with a +X chance. Camp without a fire, you are much less detectable, but you have to sleep someplace hidden and uncomfortable, and munch on cold trail rations. Make a Con or Wis check, if you fail you have a -1 penalty to rolls during the morning of the next day, as you are grump. Roll for a night encounter with a -Y chance. Come up with some smart way of having a concealed, smokeless fire, or something like that, enjoy a hot meal but without giving away your location. Roll for a night encounter with a -Y chance. Instead of moving slowly or investing in the Survival skill, you have a scout or two. They range ahead, are stealthier and better at noticing potential problems, and thus effectively reduce your chance of having an encounter – or simply detect it soon enough that the party can make a choice. However, if the scouts make a mistake, the big consequence is that they are some distance from the party, and could get cut off, or their scouting alerts the monsters, who set up an ambush or start to otherwise track the party when before they were unaware of their presence. I agree there needs to be a trade-off. Perhaps moving more slowly reduces the chance of a random encounter, or the chance of certain kinds of random encounters (maybe with the less alert creatures on your list), but because you move more slowly you are just out in the wilderness longer, and thus roll on the table more times. Or you use more supplies (but maybe you do not care about that type of book keeping). Maybe this is making your random encounter system too complicated. And, maybe, if the players do not realize that these adjustments are happening in some way, they will not see their choice is making a difference. Would you at least tell them some of the details of what they gain or give up taking a certain action? In a classic D&D campaign without Survival skill, this is harder to implement. Then again, there’s no need to “reward” players for their choices made during character creation. The examples you provided make sense, but they are complicated. I fear I’d have to look them up during the session. “Ok, one day later – let me check my house rule – uhm… <roll> <roll> …” And I fear you’re right in that depending on the numbers chosen, players have very little ability to influence their chances. Making the roll and public and announcing the modifiers – or having one of the players roll – would be a good way to inform players and to keep them engaged. I might try the following, though. have a list of possible trade-offs available: use a d12 instead of a d6 if the party has at least one druid or ranger or if you move at half speed; if you bring hirelings along, there will a random encounter check during the resting period because setting up camp and packing up both require orders and questions and discipline. I read a blog post where the author tried to refute the quantum ogre argument. (I tried to post this comment over there but apparently it triggered some anti-spam measures.) It seems to me that the author’s refutation of the quantum ogre argument rests on the assumption that palette shifting is only recognizable as such when it is observed. Thus, if it cannot be observed, a fun encounter with an ogre happens without players feeling robbed of their agency. This is true. But when I read the Hack & Slash post, I felt there was an additional point to be made: I’d have more fun learning something about the surrounding area and the whereabouts of ogres and then deciding for myself whether I wanted to engage it or not – even if the encounter with the ogre itself is very entertaining. That, I feel, is empowering. That, I feel, makes me aware of the fact that I’m not being railroaded. My choice matters. Railroading happens when players can only choose to go forward and meet the ogre. This can be very entertaining none the less because the encounter with the ogre has the potential of great fun being had by all. Being able to make a random choice without information to base it on and then meeting the ogre anyway is just as good. 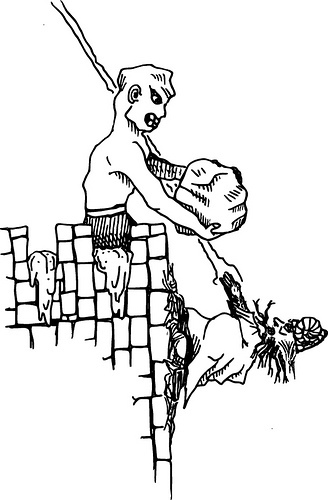 Players have the illusion of choice and encounter the ogre. The encounter with the ogre has the potential of great fun being had by all. But as a player, I can’t tell whether I’ve been railroaded. I made some choice and somehow I ended up in an encounter with an ogre. I don’t know how to feel about that. Awesome player agency happens if players learn that ogres are in one direction and no ogres are in the other direction. Then they can choose to encounter the ogre, or they can choose to go the other way. Even though the encounter with the ogre has the potential of great fun being had by all, offering the choice promises an independent and different kind of joy to some players (like me). 1: Some orc hunters gutting the giant centipede they killed. 11: a ghoul just heading out from or returning to his lair under a nearby rock formation. 12: scared and lost kobold boy with a slightly less scared but equally lost kobold girl, hiding under some tree roots. 13: the camp of a band of young orc warriors out on a mission of revenge: guards, fires, tents, half-dead captives. When the PCs are moving, roll both tables. When the PCs are camped, roll only “who walks there”. At evening and dawn, roll +5, at night roll +10. if you have two events, consider one of them happening just before, after or during the PCs contact with the other. treat each event not as an isolated thing but as potentially the tip of an iceberg that could be explored by the PCs. The event came up: that means the iceberg could be reality already! even if the PCs do not explore the iceberg, it can still invade their course if logic dictates that is does. if the event dictates that something is here or not far from here: place it on the map, cause now it really is! Two new things here (to me at least): That its two tables instead of one and that its “in the vicinity” events not concrete encounters. The tone I stole from Monday’s next game, the style of the content is stole from Vornheim. I like the list, Lior. It’s hard to imagine that game being much fun because the result of the player’s choices is determined before he’s made them. (This is the same reason that Tic-Tac-Toe isn’t fun.) Agency, then, requires that we be able to predict the consequences of our choices, but not with certainty. D&D creates agency with its Core Mechanic: “To determine if your character success at a task, you roll a d20, add any relevant modifiers and compare the result to a target number. If the result equals or exceeds the target number, your character succeeds. If the result is lower, you fail.” The relevant modifiers and the target number provide causality. The d20 provides uncertainty. Both are essential. I like this description very much. Using the regional lists I suggested or providing the “things that they can choose to do that can decrease (or increase) the likelihood of a random encounter” Adrian suggested seem to be appropriate solutions. Perfect spot, just at the right time! Heal +1 HP if you take it. Get +1 bonus on all sorts of things, cause theres water, wood and shelter here. You find a great spot, but is only after noon. If you stay: like 1 but you advanced 25% less than normal. Otherwise: roll again. You haven’t seen a flat and open spot of land for hours now and its starting to get dark. Roll again here with +2 and its evening (no more healing and +5 on the random event tables)! Its starting to rain. You find a spot, but it barely has any shelter. If you stay here: no healing and you all get soaking wet. Otherwise roll again here with +2 and its evening (no more healing and +5 on the random event tables)! Its already pretty dark when you find a spot. Normal healing if you stay here. Otherwise roll again here with +2 and its evening (no more healing and +5 on the random event tables)! You find a nice spot but it’s sort of out in the open. -2 for staying undetected and its evening (no healing and +5 on the random event tables) if you stay here. Otherwise: roll again with +4 (max out at 8) and its night (no healing and +10 on the random event tables)! Tired and hungry you finally find a spot, just after the last sun rays disappeared. If you stay here: -1 HP for all wounded and +10 on the random event tables. Otherwise: roll again with +4 (max out at 8) and its night (no healing and +10 on the random event tables)! If random encounters are of the form “You encounter <number> <monster>, fight!”: The players cannot get any information prior to the GM rolling (obviously) and once the GM has rolled the battle pretty much commences immediately. The way many random encounter tables are written, they can be interpreted to mean that this is exactly how it should be done. On this level I understand the critique, but the argument is pretty trivial. What’s the problem with improvising just a little bit more meat to those bare bones and feeding that to the players before th actual encounter? Then again, if you are basically in Constant Dungeon Mode (open door, fight, loot, open door... repeat until TPK) then you might naturally play random encounters like the dice is rolled when the door is opened and the fight begins when the door is opened... Is that really the core of the critique? That cannot be it. I found the emphasis on information in this discussion confusing at first. I would personally put much more weight on the question of how the players can react to an event in an interesting way (impro vs randomized vs prepped) or on how much are player’s wishes are dis/respected by introducing an event (again, impro vs randomized vs prepped). But then I remembered that this is basically a discussion internal to D&D only. And in D&D, tactical planning and execution is very important (I hear even more so in 4e then before) while on the other hand the depth of the characters on anything other than tactical considerations is mostly undeveloped. In this context “player’s wishes” has much less meaning: the player’s wishes are supposed to more or less align with those of the PCs and the PC’s wishes are supposed to be fucked with... Classic D&D as played by many people doesn’t support “my dwarf is about deciding between honor and empathy” very well. Neither is “my paladin is constantly in danger of being seduced by evil” a player vision which will work well without some major departure from tradition. Those are ideas I bring with me from Story Now (i.e Narrativism) and they hinder me in understanding how D&D players see their game. When I leave those concepts aside I start to see that there is not much “after the encounter” or “between the fights”. That, in classic D&D, is fluff space where you hang out in the tavern or you study the rules for some new spells to learn next. It’s all about the tactics of the fight and thus of course the information you get prior to the fight are paramount. This, to me, explains why information is equaled to player agency so often. Which brings me to another aspect: “fun = information power to act on those information fidelity of the game rules” and “fun = game world verisimilitude plot integrity”... Sorry to bring that up in your blog Alex, but that is classic Step On Up (Gameism) vs The Right To Dream (Simulationism) dichotomy. So -C and Kevin may never agree, because they want the fun of playing to come from different types of play. And I will never fully agree with neither, because - as I recognize now more and more - I am at heart a Story Now guy. The attempt to define the success or failure of sandboxes by measuring player agency as defined by -C is (unknowingly) an attempt to define sandboxes as a realm of gameism. Now that I write this, this also kind of explains to me the point of by-hex located encounters. I personally don’t see the use of it. If its a good (i.e. interesting) encounter, place it in a random encounter table or drop it on my when it feels right, both are OK for me. If its not interesting, I prefer not to waste time on it no matter how I would bump into it. But to Game On Up people the fairness is important and for that they might value the fix nature of a fire giant, him staying put in some obscure hex until the PCs bump into him and the preparation of the PCs at that moment being both wholly owned and justly reaped by the players. For The Right To Dream people, what counts is that the fictional vision is unbroken and to that purpose, randomness is a danger. Sheesh, I can finally put that discussion behind me! Sorry for spilling all this theory jabber on your blog... ignore at will. I think your last point essentially sums up this discussion quite well. Though admittedly I’m never willing to categorize any discussion complete and as a result I would amend the “Right to Dream” side of the argument in that random is allowable but must have a seed of reality (whatever that might mean in the game dream-space) in order to make it believable per se.